Spend a sensational Summer helping the Rangers run Pinecreek Hills National Park. Help people from the Community become Volunteer Rangers. Organise events on beautiful lakes, rivers and trails. Ride the new Bluewaters Queen Steamboat. Explore the exciting Pinecreek Glades by AirBoat. Camp and Picnic beside Redwood Bayou, explore atmospheric Waterfalls, enchanted Gorges and Gorgeous outdoor locations. Enjoy fabulous scenery, have Campfires, spot Bears, Deer and Eagles. See Pinecreek’s historic buildings and landmarks. Help Rangers train Volunteers. Play great Hogs & Puzzles, Spot 100’s of Animals, Birds, Fish and Wildlife. Protect the environment and get Souvenirs and Awards along the way. Stunning Hogs and Superb Mini Puzzle. Unique Fully Illustrated Wildlife Notebook. 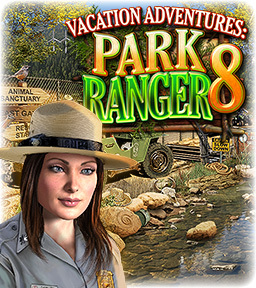 Enjoy a Park Ranger’s fabulous Lifestyle. Interactive map for Scene Replay & Rewards.